Here are three reasons I am happy to have committed to reducing the number of objects I own. I hope that these reasons will serve as an inspiration to you if you are in the process of downsizing. I know that these benefits motivate me to re-evaluate my possessions on a nearly daily basis. 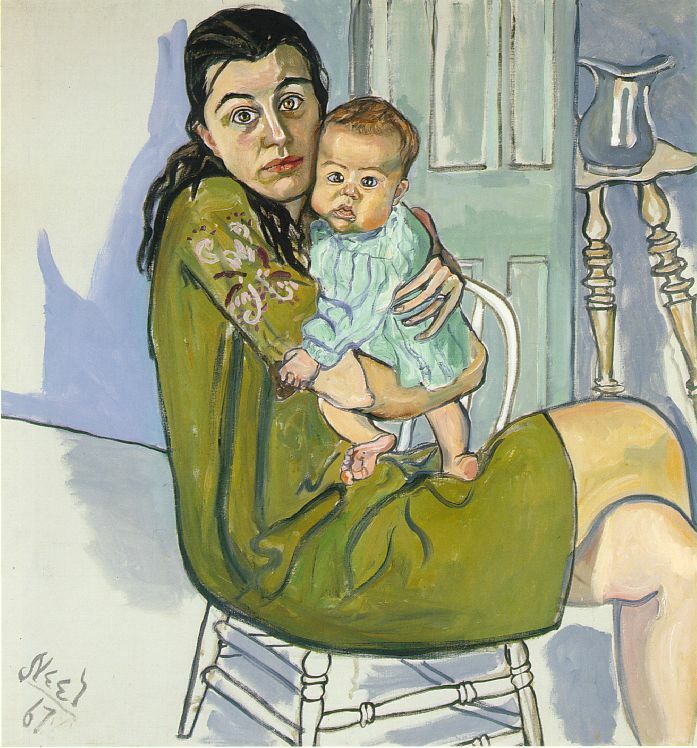 "Nancy and Olivia" by Alice Neel. The subjects are Neel's daughter-in-law and granddaughter. This portrait seems to say a lot about familial ownership. I truly recognize, experience, and appreciate the value of every object that I own. I can enjoy walking through a store, even the uber-lovely Anthropologie, to just appreciate the ingenuity and craftsmanship that went into an object without having to evaluate if I can afford it or bother thinking about what I'd do with it. It's sort of like the effect of strolling through a museum. I'm not filthy rich so I can't afford an Alice Neel portrait, but you best believe I went to visit her exhibit at the Whitney weekly the summer of 2000. (I got in for free with my CUNY ID!) I will always fondly remember those visits. Every object that I own is something I have to be responsible for. I must be responsible and exhaustively inquisitive when acquiring objects: Is it Fair-trade? Vegan? Local? Organic? And, if it's being sold on a blanket on Avenue C, I can't help but wonder did the salesman steal it for crack money? Or does it have bed bugs? Once I own an object, I must store it and maintain it in good condition. Once I don't want the object anymore, I must consider if it's life post-Olivia. I have to come up with either a donation plan or a plan for responsibly disposing of it. Blah blah blah blah blah. Why bother? Less ownership equals less responsibility which equals less headache! Less headache means more time to enjoy the things I do own and, more importantly, to enjoy my life experiences.